Tags: idle, champions, update, tomb of annihilation, azaka, spotlight. Welcome to what will hopefully be the first of many new dev blogs highlighting our Champions. We hope this blog will give you all the details you need on our newest Champion: Azaka Stormfang - Weretiger Fighter. She's launching in the update set to go live tomorrow - Wednesday August 8th, but we wanted to give folks a day to get ready for her arrival! Azaka is unlocked by completing the two Azaka's Procession variants at the end of the Tomb of Annihilation campaign, so if you haven't completed the campaign yet, get cracking! It's quite a challenge to unlock her, but we've increased the level cap for Champions this week as well, so that should help you push a bit further. Once you acquire Azaka, she swaps with Arkhan or Zorbu. In each of our campaigns, we want to unlock multiple permanent Champions. 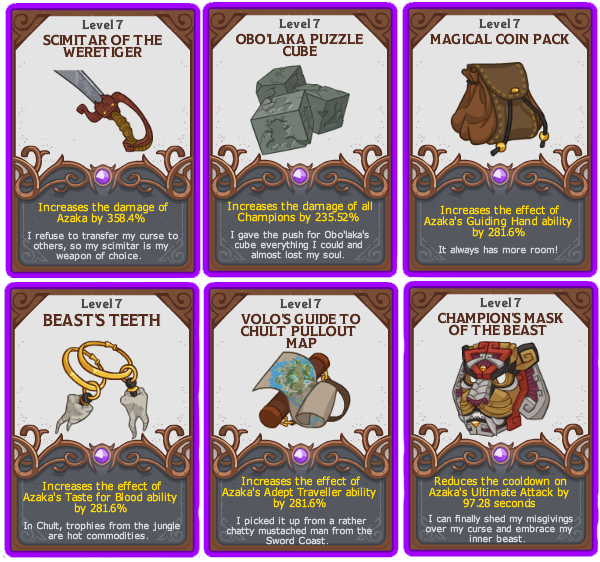 These are Champions that you can unlock as an achievements for completing a certain level of a campaign, whose equipment gets added to regular gold & silver chests once you collect them. The Grand Tour has Drizzt Do'Urden (unlockable in a variant of the Underdeep Cartography adventure), and now Tomb of Annihilation has Azaka Stormfang. We're looking forward to unlocking more permanent Champions in the future. We chose Azaka as our first permanent Champion in the Tomb of Annihilation campaign because of our fans. Let me explain. When we began designing the Tomb of Annihilation campaign, we needed a guide to get us around Chult. 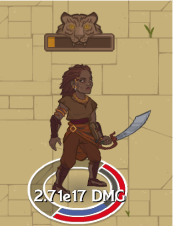 We chose Azaka as our guide in much the same way that any DM running the Tomb of Annihilation TRPG campaign might, since she is a listed as one of the possible guides within the book. Azaka joined the Champions as a guide to Chult in the fifth Tomb of Annihilation adventure: The Templar's Camp. However, once she was around for a few adventures, Dylan started hearing requests on our official Discord and livestream for her to join the Champions. We didn't realize how quickly our fans had become attached to our guide, but as soon as we heard the request, we realized how much we liked the idea. Suddenly, our first Tomb campaign Champion was born! We wanted to make sure Azaka could be impactful to your late game strategy once you acquire her. Rather than look at what she could do differently in the slot, we focused instead on what she wanted to do as a character. As a weretiger, she's really a beast of two worlds, and we wanted to reflect that in her design. Additionally, we didn't want to go the same route as Tyril where her weretiger form was just one option out of her specializations. We wanted to highlight swapping between human & weretiger forms as the cornerstone of her design. Her Curse of Lycanthropy ability dictates how she transforms. In human form, the counter over her head tracks how long until she transforms again (normally 20 attacks). In her weretiger form, the counter counts down till she transforms back to a human (normally 60 seconds). The red arrows remind you that she gets stronger with every attack. As a guide, she hides her weretiger curse from the heroes as long as possible, so we wanted to make sure she felt like more of a guide than a raging beast of DPS all the time so we leaned on her increasing gold find in human form with her Guiding Hand ability. While in human form she increases gold find by 20%. This percentage continues to increase as you gain levels with Azaka, but it is decreased by 50% while she is in weretiger form. We also wanted to show how adept she was at traversing the jungle. We started with a formation-wide boost to damage while in Chult. However, we didn't want her to only be a viable Champion in the Tomb of Annihilation campaign, so we extended her Adept Traveler ability to any outdoor area, which there is plenty of in Chult. When we looked at her Weretiger form, we leaned on the narrative that we designed around her final assault on the Lost City of Omu. The Champions were captured and Azaka (in her weretiger form) assaults 3 of the shrines on her own, single-handedly collecting a third of the puzzle cubes that the Champions need before she succumbed to the death curse. Because of that story beat, we wanted to allow her to continue to grow in strength the longer she remains in her weretiger form. From that discussion, her Taste for Blood ability was born. Each time she attacks in weretiger form, she does 10% more damage than the previous attack (stacking multiplicatively). If you can maximize her time as a weretiger, she's a beast on the battlefield! So we felt like we had a good idea of what her two forms would do, then we needed to work out the specializations. As I noted above, we didn't want her weretiger form to just be a specialization route, we wanted her transformation to be available early and used often. 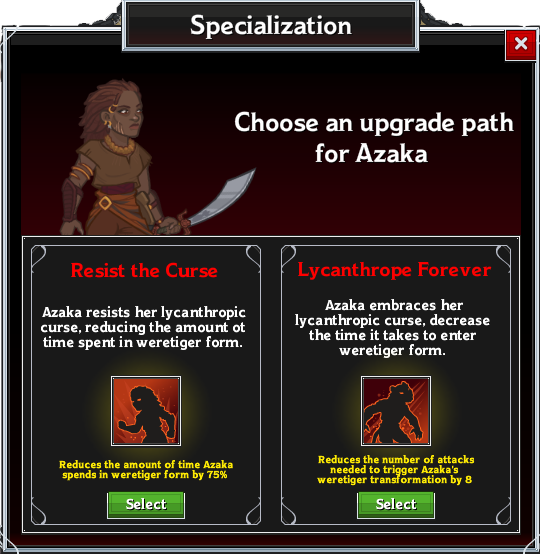 Her specializations allow you to highlight which version of Azaka you need for that adventure. In order to do that we decided the dial we would turn would be the length of time she spends as a weretiger. If you choose Resist the Curse, she spends less time as a weretiger (from 60 seconds to 15 seconds), focusing instead on the gold find boost of her human form more often. If you choose Lycanthrope Forever, instead of transforming into a weretiger after 20 attacks, she transforms into weretiger every 12 attacks instead, maximizing how often she shifts into weretiger form. We decided early on that her ultimate attack would be tied to her Mask of the Beast, a magic item listed in the Tomb of Annihilation campaign. When she uses the mask, she can cast the spell animal friendship, so her ultimate has her donning the mask and calling two tigers to her aid. The tigers have two abilities that are tied to her specialization. Their attacks (every 5 seconds) count as her attacks for the purposes of Curse of Lycanthropy, advancing your counter into weretiger form quicker. 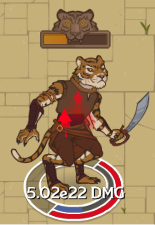 For the duration of the ultimate, the countdown out of weretiger form is paused. So instead of the normal 60 seconds in weretiger form, you get 60 seconds + whatever time you spend as a weretiger while the ultimate is active. 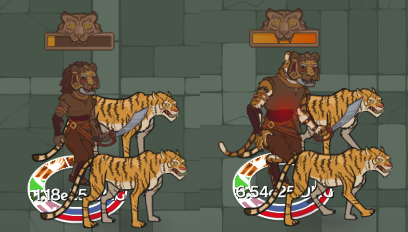 Attacks by the tigers cause enemies to drop gold whether or not they are killed by the attack. They will still drop gold when they are killed. Azaka has 6 equipment slots, and a variety of Chult-inspired equipment to collect. Azaka's Scimitar is always by her side, granting her a bonus to her DPS. The puzzle cubes remind Azaka of a great moment of triumph for her and her friends, granting a bonus to the party's DPS. Azaka's Coin Pouch grants a bonus to her Guiding Hand ability, increasing the party's gold find while Azaka is in the formation. Azaka's Earrings grant a bonus to her Taste for Blood ability, increasing her damage in weretiger form. Azaka is an adept guide throughout chult. As such, her map grants a bonus to her Adept Traveler ability, increasing the party's DPS whenever they are in an outdoors area. Azaka's Mask of the Beast decreases the cooldown of her ultimate attack, allowing her to use her Mask of the Beast more often. We're super excited to introduce Azaka into the game. We think she's going to be a strong DPS character who can also help you boost your gold find and help you get to your Champions' level cap sooner and push to your wall. However, we can only design and test a Champion so much. We'll be watching the discussion online and on discord to see how well she's received, so let us know what you think on Facebook, Twitter, or on the official Discord!